The BMW 2002 is practical, roomy and economical. But in spite of all that it isn’t boring. Most cars simply are not built to preform in such a way that driving becomes an end – not merely a means of getting somewhere. The BMW, on the other hand, is. If a single generalization could be made to describe all BMW automobiles, it would be that each is a unique combination not only of the refined luxury you’d expect in a costly European car, but also of the extraordinary performance you’d expect only in a sports car. What is it that makes a car so impressive that – for six years running – the readers of Car & Driver magazine voted it “The Best Sports Sedan in the World”? Technically, the 2002 is a combination of an exceptionally responsive 2-liter engine, legendary suspension, unusually reliable performance, innovative safety features, efficient user of fuel and practical use of space. 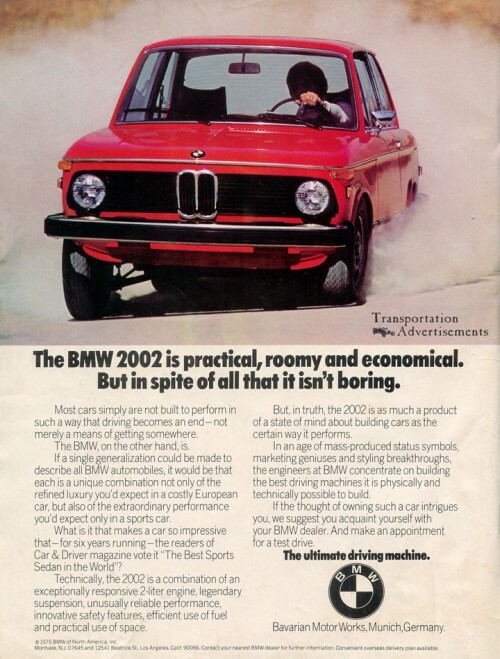 But, in truth, the 2002 is as much a product of a state of mind about building cars as the certain way it preforms. In an age of mass-produced status symbols, marketing geniuses and styling breakthroughs, the engineers at BMW concentrate on building the best driving machines it is physically and technically possible to build. If the thought of owning such a car intrigues you, we suggest you aquatint yourself with your BMW dealer. And make an appointment for a test drive. Bavarian Motor Works, Munich, Germany. 1975 BMW of North America, Inc.
Montvale, N.J. 07645 and 12541 Beatrrice St. Los Angeles, Calif. 90066. Contact your nearest BMW dealer for further information. Convenient overseas delivery plan available. Transportation Advertisements is powered by	WordPress 5.0.4 and delivered to you in 0.404 seconds using 28 queries.